Messe München will be hosting next week’s Laser World of Photonics exhibition and conference from June 26th for 4 days, and Elliot Scientific will be on Stand 232 in Hall B3. We will be showing our new DAli 3 Device Automatic Alignment Systems with USB interface, demonstrating live particle trapping using our popular Optical Tweezers system, and giving visitors the opportunity to experience first-hand the quality and precision of our Elliot|Martock range. So come and see XYZ Flexure Stages, smooth miniature positioning slides, and more! Our extensive portfolio of precision opto-mechanical components, custom design solutions, and a myriad other products that we distribute in the UK and Ireland can also be discussed with our knowledgeable and friendly team. Messe München will be hosting next week’s Laser World of Photonics exhibition and conference from June 22nd for 4 days, and Elliot Scientific will be on Stand 260 in Hall B3. We will be showing our new E1100 3-Channel Piezo Actuator Controllers, demonstrating live particle trapping using our popular E3500 Optical Tweezers system, and giving visitors the opportunity to experience first-hand the quality and precision of our Elliot|Martock range. So come and see XYZ Flexure Stages, smooth miniature positioning slides, and screw adjuster sets with up to 508 TPI ! Attendees can visit Elliot Scientific on Stand 306 in Hall C1 and see our Optical Tweezers system live – as we are doing real time demonstrations. They can also take advantage of the opportunity to experience the quality of our Elliot|Martock flexure stages, slides, and positioners. Our extensive portfolio of precision opto-mechanical components, custom design solutions, and myriad other products that we offer can also be discussed with our knowledgeable and friendly team. If you cannot make it to the show, then download our 2013 catalogue. It covers our Elliot|Martock and Lab Essentials ranges in one convenient 14Mb PDF publication packed with extra details and drawings. Products & Capabilities Brochure 2012: Download it now. Products & Capabilities 2012 is available for download. 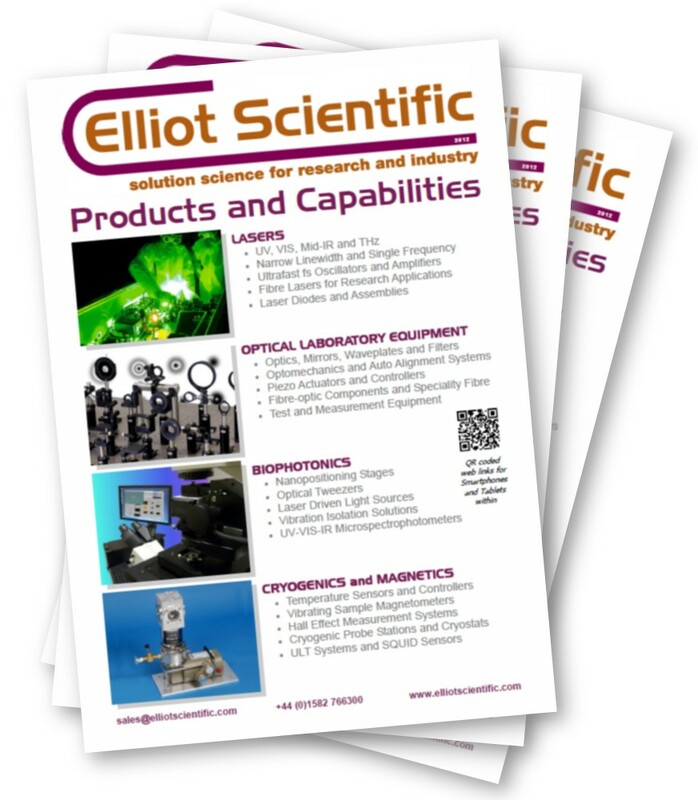 This all-new brochure from Elliot Scientific details the broad range of products and equipment we offer from leading companies around the globe and our own ranges designed and manufactured in-house. Printed copies of the brochure are also available. Contact us to have one posted to you, or simply pick one up at any conference or exhibition we are attending. Our next is Photonics West in January, with Biophysical 56 in February and CLEO in May. Products & Capabilities 2012 is now available for download. This all-new brochure from Elliot Scientific details the broad range of products and equipment we offer from leading companies around the globe and our own ranges designed and manufactured in-house. In December, printed copies of the brochure will be available. Contact us to have one posted to you, or simply pick one up at any conference or exhibition we are attending. Our next outing is Photonics West in January, with Biophysical 56 in February and CLEO in May.